High-function cat ear earphones with LED "AXENT WEAR" Cat Ear Headphones Shipped with USPS Priority Mail (1 to 3 business days). ・ It is a headphone full of originality, compatible with cute and cyber appearance and functionality. Frequency band (headphones): 20Hz to 20kHz. Ear parts: Sealed. [As for the products with the lithium battery ]. ● You need to get an import permit from Ministry of International Trade and Industry tog get your item if your item is more than 1000 MXN. Cat ear headphone at the top to use as a speaker, you can share music with friends around. Product specifications ear piece: closed-type frequency (headphone): 20 Hz-20 kHz frequency range (speaker): 200 Hz ~ 18 kHz impedance: 32 ƒ¶ input: 3.5 mm cable 4-pole (microphone input available) batteries: charging (USB compatible) New LED headphones with high-function cat ear AXENT headphones Purple Japan F/S. Label: AXENT WEAR. Middle East. By using headphones the top of the cat ear as a speaker, you can share with friends sound around. AXENT WEAR. cute and were both cyber look and functionality, is a highly original headphones. [ Other Carrier ]. This is a headphone of AXENT WEAR. Cute and was both a cyber look and functionality, is a highly original headphones. If you get it as quickly as possible. Earpiece Design: Ear-Cup (Over the ear). Product: Cat's Ear Shaped Headphone. Wireless Technology: Bluetooth. We will pursue the best service! Your pleasure will be our pleasure. Cat Ear Headphones. The latest fusion of fashion and functionality with external cat ear speakers and LED lights. Cat ear speaker. Headphone audio. Detachable Headphone Cave (3.5 mm). Label: AXENT WEAR. Weight :1.2Kg. Condition: New. It is our pleasure to provide high-quality Japanese products to the world. to you in comfort, and want you to enjoy the product. AXENT WEAR. LED lights and cat ears, a futuristic design with cute, " It is not only in the charm of a portion of AXENT WEAR ". headphones the top of the cat ears to use as a speaker, you can share with friends sound around. Cushioned headphones that cover the entire ear block external noise. Let's share music with cat ear speaker. It is a headphone full of originality that balances cute and cyber appearance and functionality. AXENT WEAR. LED lights and cat ears, a futuristic design with cute, " It is not only in the charm of a portion of AXENT WEAR ". cute and were both cyber look and functionality, is a highly original headphones. It is a headphone full of originality, compatible with cute and cyber appearance and functionality. We will try our best to resolve the issue! God bless you! Finally landing in Japan ! By using headphones the top of the cat ear as a speaker, you will be able to share with a friend sound around. Earmuffs parts: a closed type frequency band (headphones): 20Hz ~ 20kHz. ・Frequency band (headphones): 20 Hz to 20 kHz. ・Input: 3.5 mm cable 4 pole (microphone input possible). ・Frequency band (speaker): 200 Hz to 18 kHz. ・Eared part: Sealed type. Headphones full of originality compatible with cute and cyber looks and functionality is. Second generation product fully upgraded functionality ! Ariana · Grande sign filled quantity limited edition, now when buying ! If a conversion adapter can handle the electric power, all you need to do to use the product in your country is to change the plug to type A. We will try our best to resolve the issue! 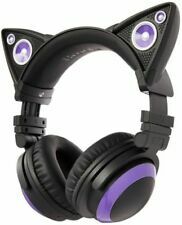 LED headphones with high-function cat ear AXENT headphones Purple. Label: AXENT WEAR. Weight :1.2Kg. Condition: New. It is our pleasure to provide high-quality Japanese products to the world. to you in comfort, and want you to enjoy the product. Usa,Canada,Australia USD20. EMS Asia USD15. AXENT WEAR. | cute and were both cyber look and functionality, is a highly original headphones. | This product is parallel import goods of US goods sold. All such instructions will be English. Japan Usage Item. Label: AXENT WEAR. Weight :1.2Kg. Condition: New. By using the cat ear at the top of the headphones as a speaker, you can share sound with friends around you. [Product specifications] Earmuff part: Sealed frequency band (headphone): 20 Hz to 20 kHz Frequency band (speaker): 200 Hz to 18 kHz Impedance: 32 Ω Input: 3.5 mm Cable 4 pole (microphone input possible) Battery: Charging. 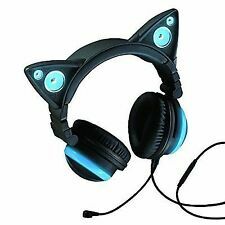 Wired Cat Ear Headphones 4color AXENT WEAR Free Shipping F/S New color Blue!!! 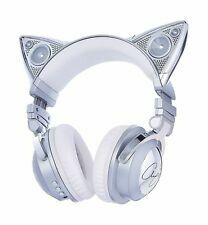 Wired Cat Ear Headphones 4color AXENT WEAR from JAPAN F/S New! As a proof of that, Toei 's Golden Sticker is put on the product. We would like to have people around the world use this wonderful product for sale. Earpiece DesignEar-Cup (Over the Ear). FeaturesAriana Grande. As a proof of that, Toei 's Golden Sticker is put on the product. Color : Green / Purple /. The products in Japan are very precise and the quality is also very wonderful. We would like to have people around the world use this wonderful product for sale. Label: AXENT WEAR. Condition: New. I will provide courteous and responsive service. Our Products are 100% Authentic. I will look it for you. I will respond quickly and seriously. Each other 's Biker. Frequency band (headphones): 20 Hz to 20 kHz. We will try our best to resolve the issue! God bless you! It is a headphone full of originality, compatible with cute and cyber appearance and functionality. AXENT headphones Purple F/S New. LED headphones with high-function cat ear AXENT headphones Purple. Label: AXENT WEAR. LED headphones with high-function cat ear. Weight :1.2Kg. Condition: New. Earpiece DesignEar-Cup (Over the Ear). FeaturesAriana Grande. Country/Region of ManufactureJapan. Japanese Area Industry Promotion Association(JAIP). Wired Cat Ear Headphones 4color AXENT WEAR from JAPAN F/S New! Purple F/S RARE ! Color : Green /Purple / Blue / Red. As a proof of that, Toei 's Golden Sticker is put on the product. The products in Japan are very precise and the quality is also very wonderful. Be sure to find the item and provide it to you.